As a fan of the concept, I think the game has fantastic scope. Wizards and magic capture my attention and imagination every time. 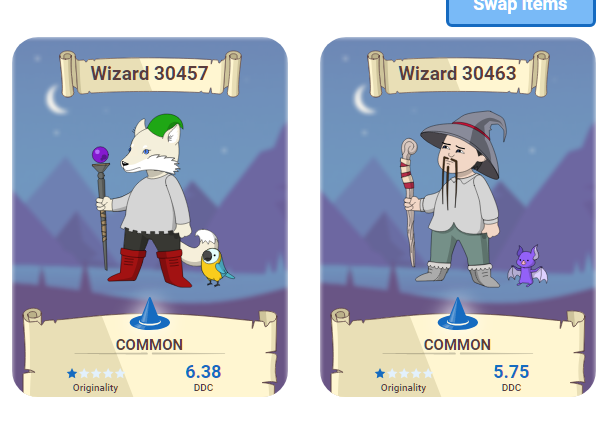 Presently, in terms of functionality, it is possible to unbox free wizards (if you are eligible,) buy new wizards (at last count there were 15587,) buy items and clothing and swap items among your own wizards. Soon there will be a p2p marketplace and wizard battling released. Wizard.....battle......tournaments..... I can't wait. I must say that there is presently a lot we don't know about how the game will work, what the full economic model will be or how it will evolve into the future. So if you want to get involved early, please be aware of the risks and make sure you only spend your precious EOS carefully and wisely, if at all. 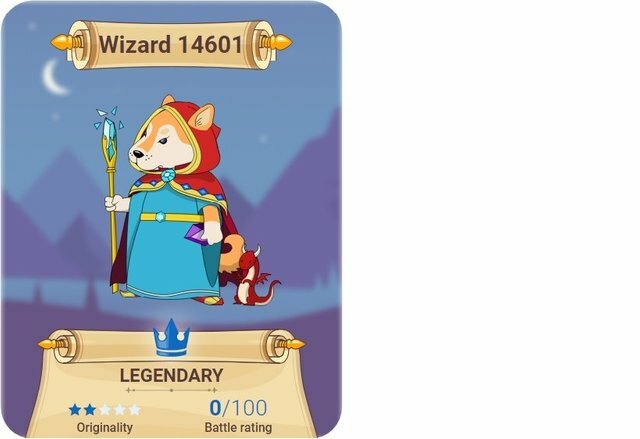 Anyway, much of the current Wizards.one community is preparing for the launch of the market and battle functions, helping each other out in the telegram chat channel, creating memes, creating wizard character back stories, building wizard guilds, building helpful community tools (like https://cryptobeings.com) discussing possibilities and everything else to help the time pass! I decided to write a brief, unoffical history for the wizards. I hope you enjoy it. From the first moments of it's fiery birth, magic had bathed the planet Iophus. The magic's source, the great, iridescent sun at the centre of the solar system around which the planet and it's moons orbited, was know as The One. Magic had played a significant part in the evolution of life on Iophus and it's influence flowed through every inhabitant and was the lifeblood of all it's ecology. From the shores of the Amber Sea, to the Singing Glass Mountains. From the vast Dragon Tree Forest, to the blue fire-lakes of the Broken Plains, magic lived within and influenced everything. As sentient beings evolved on Iophus, their understanding of magic and use to which it was put became more and more complex. What began as a generalised and gentle influence of magical energy by the various races (according to their particular affinities,) rapidly evolved to become one of the greatest seats of magical knowledge in the known universe. The ever more sophisticated study and voracious pursuit of magical knowledge brought about the first wizards on Iophus.....Wizards of The One. Over time the name became Wizards One, mean't to signify unity among the wizards of all races, to show respect for the source and to indicate a shared vision where magical knowledge was for all of Iophus. After the first wizard guilds formed, covering every speciality under the One, an age of almost unprecedented discovery began. Sadly, fierce competition between the guilds developed and grew. They began to horde their knowledge and sought to gain supremacy over the other guilds and the rest of the free beings. The way they saw it, in their arrogance, was if they did not seek dominance, some other guild would. Eventually, the pressure to gain an advantage led to the exploration of more and more dangerous magic. One of the greatest guilds, The League of Patterns, discovered the means to open magical portals over vast distances. The leader of The League of Patterns, a wizard called Abraxis Kron, thought it would be a good idea to open a portal within The One, linking it to a portal within the Pattern Halls on Iophus. 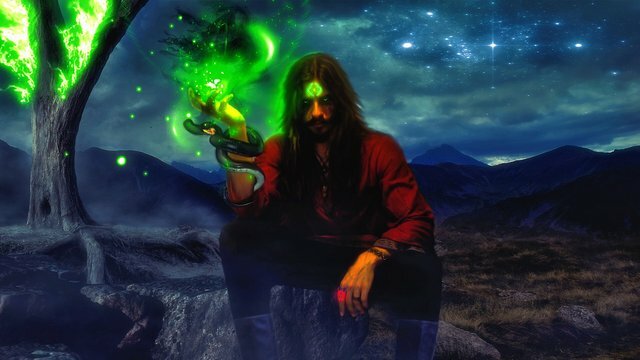 He intended to concentrate and harvest colossal amounts of magical power in order to direct it into his wizards, their spells and their artifacts. Just like that, he would become the most powerful wizard that had ever lived and his guild would rise instantly to a position of unassailable supremacy. The whole of Iophus would be under his dominion. Abraxis Kron was so consumed by arrogance and hubris that not one moment of thought was given to the possibility of something going wrong. Naturally it did. Instead of opening a portal within The One, they opened a portal into another dimension, a barren husk of a realm, devoid of all life apart from those that had made it that way.......Demons. In the confusion and whilst the wizards were caught off guard, several hundred Demons burst through the open portal. They were beings of many shapes and size, their skin colour in the light of The One appeared to be red, purple or black. Ther were several things in common however; they all had black eyes, were heavily muscled, insanely strong, covered in razor sharp fangs and talons, were extremely resistant to fire magic, extremely fast and horrifying in their wanton brutality. 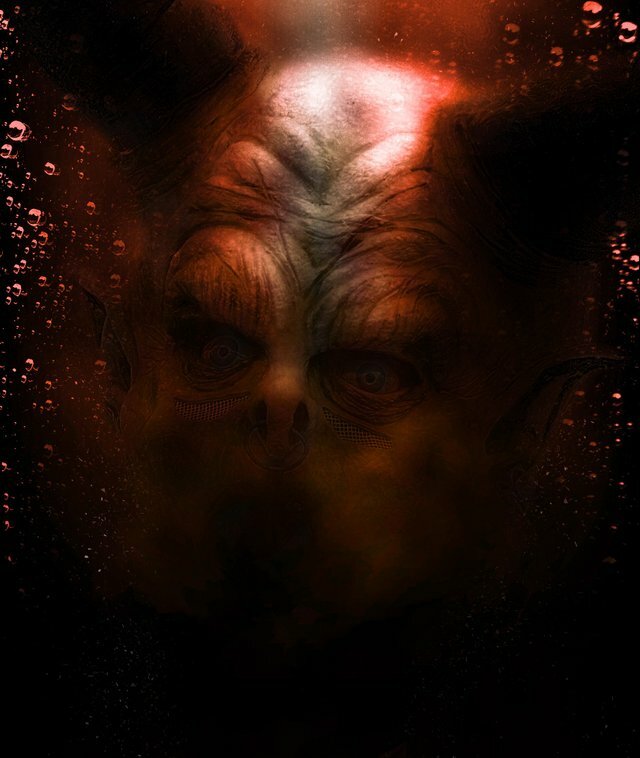 Abraxis Kron was the first to depart the world of the living, a look of dumbstruck horror etched across his face as a jet black nightmare the size of an elephant went through him. What followed was five decades of war as the wizards sought to reach the portal, close it and destroy the remaining demons. It was a desperate and bloody fight, especially during the first ten years, before the wizards managed to win back and close the portal. They had managed to build a crystal lens that could focus enough of The One's power to erect and sustain a barrier within the portal. It required an additional five wizards to permanently maintain the integrity of the crystal, which was continually degrading as a result of the massive magical energy flowing through it. After the portal barrier was erected, it took a further four decades to hunt down and eliminate the remaining demons. The effort involved most of the wizards along with the help of many of the non-wizard magical beings of Iophus. The cost in lives and collateral was monumental. By the end, the entire League of Patterns, one thousand five hundred wizards was spent and no-more. They bore the greatest responsibility for not holding Abraxis Kron back, for becoming seduced by power and consequently placed themselves in the greatest peril over and over again. It was a terrible price leaving a terrible legacy. After the war, the remaining wizards were determined never to repeat the same mistake that had led to this catastrophe. A new age of co-operation was born. 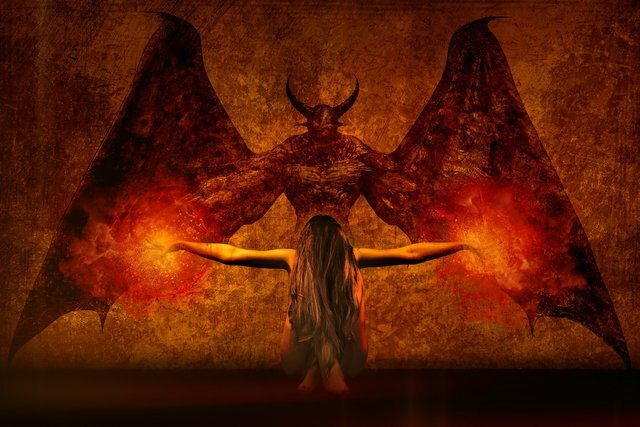 The Demons posed the ultimate threat to all, there was no room left for hubris. Every inhabitant of Iophus knew, every second of every day, the Demons were on the other side of the portal desperately, ravenously trying to get through. Every effort was made to devise a way to close the portal but it was proving to be extremely difficult. Something unspeakably powerful on the other side seemed to be resisting their efforts. Given the possibility that Iophus would face another, perhaps much worse invasion, the wizards were determined to use the time they had wisely. All wizards dedicated a proportion of their time to the study of anything that might help mitigate the Demon risk. They sought to hone their battle skills by fighting each other in great tournaments. Finally, they sought to acquire or build magical artifacts and weapons of great power. Some of the artifacts and weapons were given as prizes to help further endow the great champion wizards who would no doubt be at the fore of the defenses if the Demons broke through. And so.....for a thousand years the Wizards One evolved until they became undeniably formidable......arguably the most adept and powerful battle mages ever to have lived in the known universe. They would need to be if the Demon plague ever broke through in force....because they had never known defeat in several universes over millennia. Congratulations @benjojo! You received a personal award!